After deeply immersing myself in Civil War studies during the past four years of the sesquicentennial – including battlefield visits and tours, a weekend seminar with noted nonagenarian historian Ed Bearss, and a museum internship digitizing a trove of rediscovered diaries, memoirs and correspondence from a forgotten Massachusetts regiment – it was indeed fitting to finish up Richmond Burning: The Last Days of the Confederate Capital by Nelson Lankford in the sesquicentennial’s penultimate month and even somewhat eerie to find myself quite coincidentally reading of Lincoln’s assassination – and its reverberation in Richmond – on the exact one hundred fiftieth anniversary of this tragic event. Lankford’s well-written and informative history is essentially a snapshot of the beleaguered city on the eve of its fall to Union forces and the subsequent early days of occupation. Most striking is how unprepared both the Confederate leadership and the proud citizens of its capital city are for this eventuality, even as March turned into April 1865 and it should have been clear to even the most Panglossian among them that the long siege of Petersburg would have to end badly and that therefore Richmond would have to be abandoned in short order. Part of this optimism was driven, of course, by the fact that the city – only ninety-plus miles from the federal capital in D.C. – had been the military objective for the Army of the Potomac under a string of Union generals for four years, all of which had been thwarted. Residents had grown imbued with an unrealistic sense of invincibility even as their doomed southern republic crumbled, all of its other major cities taken, its armies in tatters. It was one minute before midnight for the Confederacy, but no one in Richmond – including its most prestigious resident, President Jefferson Davis – seemed willing to look at the clock. Davis had actually been willing to consider the loss of Richmond and had sent his family out of the city, but a kind of stubborn delusion seemed to keep him from coming to grips with its impending reality. When Petersburg indeed fell and General Robert E. Lee informed him that Richmond must be abandoned, Davis reacted with shock, especially at how little time remained. 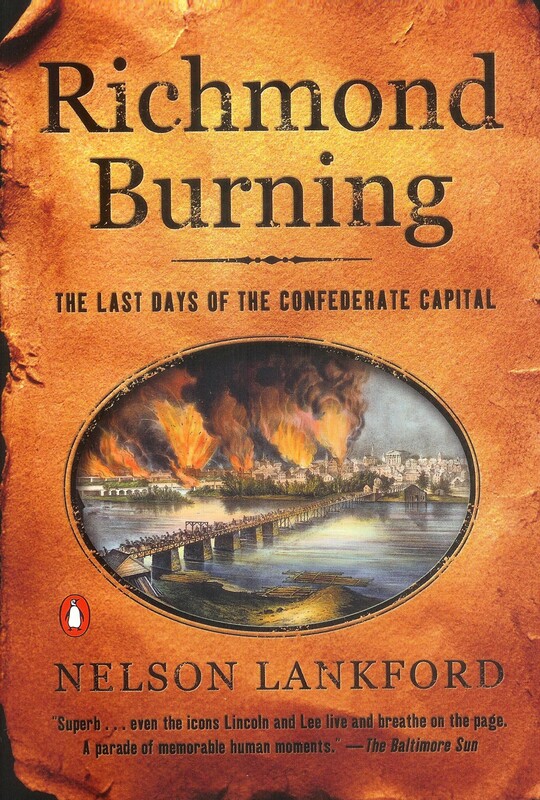 As Lankford walks us through the uneven retreat, it is apparent how deep this delusion ran, how little planning there was for this contingency, how abysmal its execution as ships are scuttled, liquor barrels smashed, bridges destroyed and – most famously – the attempt to deny resources to the conquering army spawned ill-advised fires that quickly burned out of control. At the same time, these pages of Richmond Burning reveal in the retreat one of the critical fundamental weaknesses of the entire Confederate experiment in its woefully inadequate infrastructure: “Five rail lines fed into the city at the beginning of the war, but only one link offered any hope of salvation to the Confederate government … The Richmond & Danville line . . . Like the rest of the South’s rail network, the Danville line lacked the steel rails, gravel-ballasted roadbeds, and coal-fired engines found in the North. All the rails in Virginia were iron, not steel. The ties, cut from oak and other hard­woods along the route, were laid directly in the dirt rather than in a gravel roadbed. And all of the engines were wood burners, a circumstance that required frequent stops for both fuel and water.” [p.85] Interestingly, this recalled for me the discussion in another recent read, Dominion of Memories by Susan Dunn, of Virginia’s stubborn resistance to railroad development and standardization in the 1820-30s, which further retarded its industrial capacity and its ability to compete with its neighbors to the north in peace or war. Davis and his government and the remnants of his army fled, leaving terrified residents tensed for predations by an enemy in blue long vilified while the less savory among them ran wild in the streets to loot and plunder. As it turned out, the occupying forces were remarkably constrained and disciplined, restoring order, getting the great conflagration that engulfed the city’s commercial center under control and later ensuring that a population that eyed them with a barely-restrained hatred did not starve. Lankford also reveals the surprising number of Unionists in the city who welcomed the Yankees who had come to restore the flag they loved. It is rarely acknowledged in the south today, but Unionists lived – most often in secret – throughout the states that had seceded. (In fact, every state in the Confederacy with the exception of South Carolina sent at least one regiment to fight for the Union.) The most famous to emerge in Richmond was Elizabeth Van Lew, a highly effective Union spy who had long masqueraded as feeble-minded while she waited for the city’s eventual liberation. Of course, the vast majority of citizens were far less congenial to their new circumstances, even as the dreaded Yankees proved not to be the bugaboos they had anticipated with such dread. Lankford is hardly sympathetic to them and he has been taken to task by some reviewers for his perspective. I disagree: there has been more than enough empathetic literature focused upon the defeated, who were after all hastily abandoned to the enemy with their city carelessly set ablaze by their own fleeing government. Moreover, it is enough for us to be reminded of what their chief cause – human chattel slavery – was based upon, and to be rightly repulsed by this. Especially telling in Richmond Burning is the remarkable juxtaposition of blacks – at the urging of General Lee – drilling for the Confederate army in the final days of desperation while others are chained in slave pens in the hopes that they can be hurried out of the city for sale elsewhere before the fall.